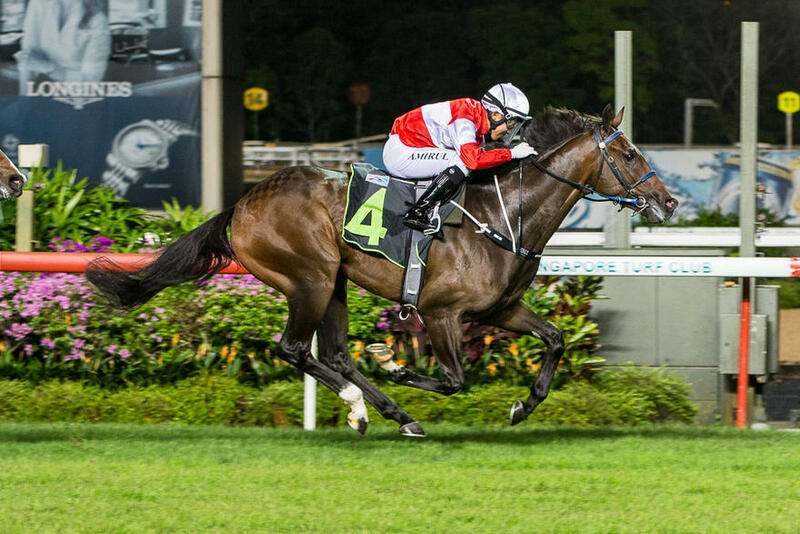 Trainer Stephen Gray was not on hand at Kranji on Friday night, but the yard was right on target with their first 2019 winner - the aptly-named Wecando. With the Kiwi handler only flying back from the Magic Millions Gold Coast Yearling Sale on Saturday, it was his racing manager Craig Geehman (pictured above) who did the honours at the Champagne Room, along with Wecando’s owners, Mr and Mrs Chen. “Stephen only flies in tomorrow. He’ll be pretty rapt with that first win for the year,” said Geehman. “It’s also a big thrill to have another winner for Mr and Mrs Chen. They have some nice horses with us, they love their racing and they’re always very happy when their horses win. “From the wide barrier, it was always the plan to roll forward even if we didn’t think he would lead – he actually led very well. “He was able to stack up the speed. The tempo was not too silly and Amirul rode him to instructions. The Per Incanto four-year-old was at his first race since his unplaced run in a Class 4 Premier race over 1200m on December 2. Drawn out the widest in 12, Wecando had the race pretty much in his keeping from a long way out once Amirul got away with some cheap sectionals upfront. Turning for home, the chances Wecando could indeed do it was not a remote possibility anymore with $11 favourite Centenary Diamond (Michael Rodd) the only one within striking distance while the rest had been clearly caught napping. After first electing for the inner route, Centenary Diamond switched to the outside for his final assault, but either way, Wecando could not be pegged back. The $73 chance kept finding to score comfortably by a margin of 1 ¼ lengths from Centenary Diamond with Alamak (Daniel Moor) third another 1 ¾ lengths away. The winning time was 1min 23.71secs for the 1400m on the Long Course. “The other horses were a touch slow at the start. I had to make a quick decision to go forward,” said Amirul who was at his first 2019 win. Wecando has now taken his race record to two wins and two seconds from six starts for stakes money that have tipped over the $100,000 mark for the Elaine Chen Stable.